The per capita global food consumption has steadily increased over the last 60 years from an average estimated 2,358 Cal. Day-1 in 1964-66 to 2,940 Cal. Day-1 in 2015. By 2030 it is projected to be 3,050 Cal. Day-1 [1,2]. This represents a 3 % to 8 % increase every 10 years. Over the same period, the world’s population has more than doubled from 3 billion in 1960, to 7.6 billion in 2018, with a projection of 9.7 billion that by 2050 [3,4]. Global increases in agricultural productivity aim to meet the food and commercial demands [5-10]. Use of fertilizers and pesticides for increased yields [10,11] has resulted in global increase in average application rate of fertilizers from less than 100 Kg.ha-1 in 2004 to more than 146 Kg.ha-1 in 2014, depicting on average a 46 % increase in 10 years [3,12]. The pesticides market expanded by 50 % at US$ 13 billion between 2000 and 2007, resulting to a US$ 39 billion trade market for pesticides [13,14]. The increase in the use of fertilizers and pesticides enhance environmental risks associated with agriculture [7,10], and linked habitat modification or loss and decline in terrestrial and aquatic ecosystem services [15-18]. Transfer of fertilizer and pesticides from land to water can lead to complex and often cascading effects of eutrophication and direct toxic effects on ecosystems [19-21]. Nitrogen and phosphorus as major components of fertilizers , modify the trophic state of water bodies . Active ingredients of pesticide residues in aquatic ecosystems on the other hand, cause death, cancers, tumours and lesions; reproductive inhibition; and disruption of endocrine system . Subsequently, occurrence of nutrients and pesticides modify the presence and distribution of aquatic organisms as well as ecological processes in aquatic ecosystems. While both nutrients and pesticides from agriculture have impacts on aquatic ecosystems , combined pressure of nutrients and pesticides has not received the attention it deserves [24,25]. The objective of this paper was therefore to review the role of agriculture in contributing to combined pressure from nutrient and pesticide on aquatic ecosystems, including management measures for combined pollution. The global food consumption has increased by between 3 % and 8 % every 10 years within the last 60 years, and is projected to increase by 4 % between 2015 and 2030 (Table 1). Table 1: Global and regional per capita food consumption (kcal per capita per day). a: Excludes South Africa Source: WHO (2002) with minor editorial changes. Within the last half a century recorded global food production has increased, especially for cereals, by 138 % from 1.84 billion tonnes in 1961 to 4.38 billion tonnes in 2011 . While average per capita food production has increased by 25 % compared with the 1960s (Figure 1), there are large regional and country differences . At the same time, changes in dietary preferences have resulted in elevated food demand, expected to reach 1.1 % per year in the period 2005/2007 to 2050 . The elevated demand perpetuates food insecurity with 26 % of the global population suffering from micro-nutrients deficiency and 12 % being chronically undernourished [29,30]. Figure 1: World population and food production index. 196/61 – 2017/18 historical and 2018/19 – 2049/50 projected. 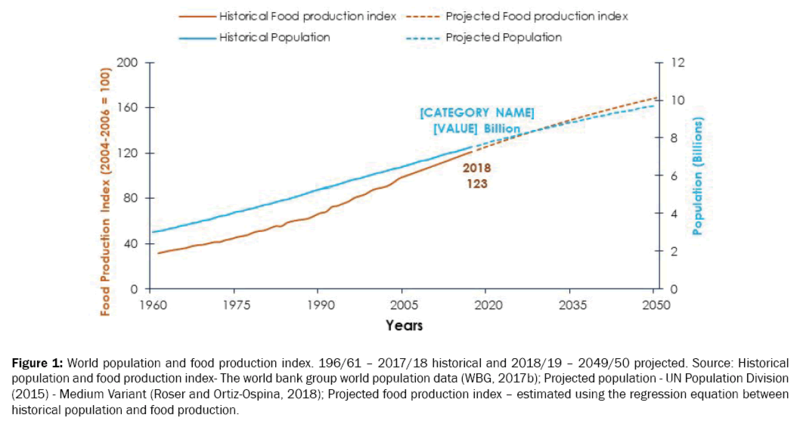 Source: Historical population and food production index- The world bank group world population data (WBG, 2017b); Projected population - UN Population Division (2015) - Medium Variant (Roser and Ortiz-Ospina, 2018); Projected food production index – estimated using the regression equation between historical population and food production. The agricultural production pressure from food consumption is exacerbated by population growth. The global population has more than doubled over the last 60 years, and is expected to be 9.7 billion by 2050 (Figure 1). To meet the food consumption need in 2050, the current global food production will need to be increased by 60% . The impacts of climate change and climate variability on agriculture are already being felt through unexpected crop failure, new pests and disease patterns, loss of livestock, and inadequate climate tolerant seeds and planting material [31,32]. With season shifts and irregular weather patterns, food production, distribution and availability will negatively be affected in the . Moreover, agriculture is a major contributor to greenhouse gases emission, resulting to further negative effect on food production . To meet the current and future food demands; agricultural expansion through clearing more crop land or more intensive use of existing crop land is being carried out . Potential environmental impacts of this expansion are not well understood . Although in many current intensive food production systems there can be a more prudent and conservative use of agro-chemicals, overall an increase of agricultural production will inevitably be accompanied by increased use of fertilizer and pesticide inputs . Fertilizers are widely used to enhance crop productivity and as a response to declining soil fertility [35-37]. The prediction by FAO [38,39] for a 4 % increase in the demand for fertilizer between 2001 and 2015 was surpassed, with an increase of 8 % being registered by 2013 at 176 million tons per year . With that in mind, the prediction by Heffer and Prud’homme  that the demand will increase by 18 % between 2009 and 2018, indicates potential exponential growth in the demand and consequently use of the fertilizers. Africa’s demand for fertilizer, for instance, was 2.5 % of the global consumption in 2010 , which increased to 3 % in 2015 and is projected to be 3.5 % by 2020. Egypt, South Africa, Morocco and Nigeria are the main consumers in the region . In 2015, Africa consumed 3 % of nitrogen and 4 % phosphates used globally. Growth rate of 3.8 % and 2.8 % for nitrogen and phosphates, respectively, are predicted between 2015 and 2020 . The increase in fertilizer use amplifies the risk to aquatic ecosystems [41,42]. This concern raises a critical knowledge need, for sustainable agricultural intensification, as well as continuous monitoring of aquatic ecosystems. Pest control is required as agriculture expands for increased yields . Pesticides including insecticides, fungicides, herbicides fumigants, rodenticides, growth regulators, defoliators, surfactants and wetting agents are used for pest control . The market value of pesticides trade has increased from USD 850 million in 1960 to USD 39 billion in 2007 . At the same time, out of the 22 chemicals listed under Persistent Organic Pollutants (POPs) by Stockholm Persistent Organic Pollutants Convention 2001 , 15 are pesticides (or are applied as pesticides). These include α, β and γ- Hexachlorocyclohexane, and DDT . The use of pesticides is indispensable in most developing countries – especially the use of herbicides, however, owing to the hot and humid conditions in tropical countries, insecticides are more common . Africa consumes 4 % of the global market of 75,000 -100,000 tons per year of pesticide active ingredients with, on average, low application rates of 1.85 Kg.ha-1 compared with the global average of 3.82 Kg.ha-1 . The increase in pesticide demand  and the necessity of the pesticide products raises concern for long term effects on recipient aquatic ecosystems . The use of pesticides is further complicated by pesticide resistance which shows a steady increase posing a threat to agricultural productivity . Control of Anopheles mosquito spreading malaria, for example, has been documented as an increased threat owing to resistance to pyrethroids in Africa , resulting in more persistent pesticides such as DDT . The increasing trend of fertilizer and pesticides use bring concomitant increased risks to waterbodies. Fertilizers and pesticides are transferred to aquatic ecosystems through aerial drift, leaching through the soil, as runoff or erosion, or spillage whether accidentally or through neglect [19,51]. Within aquatic ecosystems, the fertilizers contribute to nutrients, while pesticide residues contribute to toxic pesticide active substances. The effects of contamination in aquatic ecosystems manifest through the independent effects of nutrients and pesticides, and through the effects of a nutrient-pesticide interaction . Section 4 in this paper explores the effects nutrients and pesticides, independently and combined. Inorganic fertilizers are a source of nutrients in aquatic ecosystems, supporting primary production. Although chemical fertilizers can be used to supply 13 essential nutrients, aquatic ecosystems are mostly nitrogen and/or phosphorus limited such that additions of these elements result in eutrophication . The effects of eutrophication vary depending on the level of nutrient enrichment. Eutrophication enriches food chains by enhancing primary production and availing more energy up the aquatic food chain [22,54]. This results in more productive aquatic ecosystems and increased biomass through a bottom-up control . The increase in biomass as a result of enhanced productivity increases the amount of dissolved oxygen required for respiration by aerobic organisms . Consequently, the high oxygen demand facilitates anoxic conditions that could cause death or increased susceptibility to diseases and infections of aerobic aquatic biota . Species tolerant to high nutrient concentrations therefore, become more competitive following eutrophication, out-growing sensitive species . Alien invasive species thrive in high nutrients conditions, out-competing the indigenous biota [56,57]. The competition leads to reduced diversity and shifts in energy contributions within the aquatic food chains exhibiting a top-down trophic control [58,59]. In eutrophication stressed environments, some aquatic organisms may produce toxins to inhibit occurrence or survival of other organisms and enhance their own competitive advantage . Such toxins, for example cyanotoxins produced by cyanobacteria, affect the diversity in aquatic ecosystem and impact the food chain . The varying effects following nutrient enrichment reduces the capacity of an aquatic ecosystem to enhance economic returns from ecosystem services – such as fishing; since the survival of fish and the food chain supporting the fisheries is significantly related to ecosystem productivity . Prominent pesticide families including organochlorines, organophosphates, carbamates, pyrethroids, phenoxy and benzoic acids, and triazines have varying modes of action . The varying modes of action result to different effects, many of which are chronic and often not noticed by casual observers, yet have consequences for ecological function . For instance, DDT, methylparathion and pentachlorophenol have been shown to reduce symbiotic chemical signalling of legume-rhizobium that results in reduced nitrogen fixation, reducing yield . Pesticide poisoning can bioaccumulate to toxic concentrations up the food chain . Rachel Carson's landmark book Silent Spring (1961), for example, associated the loss of bird species to bioaccumulation of pesticides in their tissues and studies have associated reduction in bird populations, with time periods and areas in which pesticides are used . The impact of pesticides to loss on biodiversity is still being recorded globally. The environmental impact of pesticides is often greater than intended, with estimates that over 98 % of sprayed insecticides and 95 % of herbicides reach a destination other than their target [64,65]. The amount of pesticide that migrates from an application area is determined by the particular chemical properties of its active ingredients, the distance from application site to the water body, and application method [66,67]. The effects of pesticides on aquatic ecosystems are attributed to the active ingredient in the pesticide and residues formed during chemical, microbial or photochemical degradation . The effect of pesticide active ingredients (and their degradants) in the aquatic ecosystems is dependent on their chemical properties such as solubility in water, volatility, lipophilicity, degradability and particle affinity . For example: aldrin with low solubility, high volatility, high lipophilicity, high particle affinity and highly persistence in the environment could mean a high risk of impact to organisms with higher fatty tissue, especially the sediment dwelling organism; whereas thiophanate-methyl with high solubility, low lipophilicity, low particle affinity and low half-life, is less likely to pose more risk to aquatic biota . Roessink  demostrated that higher biomass of primary producers resulted in 25 % and 31 % lower concentrations in the easily brocken down polychlorinated biphenyl and polycyclic aromatic hydrocarbon respectively. This concept was described by Skei  as biomass dilution. The increase in nutrient concentrations elevate the organic matter around aquatic fauna, enhancing the potential partitioning of pesticides to the dissolved or particulate organic carbon. This results to dilution of potential toxicity, and reduced exposure to aquatic organisms . Through biomass dillution, nutrients enrichment accelerate the uptake/adsorption of pesticide residues by aquatic biota biomass, therefore the potential of chronic or acute poisoning by the pesticide residues is enhanced for the individual organism, and through bioconcentration and bioaccumulation [58,70]. As the nutrient enrichment increases, only specialized groups of phytoplankton/periphyton are able to survive. This includes cyanophytes that have considerably lower lipid concentrations that other phytoplankton . Lipophilic pesticides in the water phase are, therefore, elevated by lower adsorption efficiency of the lipids in the phytoplankton. Increase in the size of phytoplankton, owing to nutrient availability, may result to shift in the zooplankton size class to bigger species able to utilize the phytoplankton . At the same time, the bio concentration and accumulation factor of pesticide residues will increase since the phytoplankton will be accumulating more residue . Pesticide residues (herbicides) poisoning inhibit uptake of nutrients through eliminating primary producers or reducing their efficiency . As a result, the aquatic food chain would be interrupted at the basic level of primary production . On the other hand, pesticide residues (insecticides) could accelerate the uptake of nutrients, therefore, enhancing productivity of the aquatic ecosystem and thus eutrophication when top-down control is suppressed because of poisoning or elimination of organisms higher in the food chain . Higher concentration of pesticide residues may therefore result to reduced uptake of phytoplankton/ periphyton by poisoning the grazers, causing enhanced eutrophication-like symptoms, such as algal blooms. The effects of combined toxicity of nutrients and pesticide residues could be related to the trophic levels below them. When the toxicity to the prey increases and their survival is inhibited, then the survival of the higher trophic level will also be negatively affected resulting to a lower biomass, however, this might shift species richness . Metabolism and excretion of chemicals are important to the individual organism as well as to the ecosystem. Organic nutrients are metabolized and inorganic forms of nutrients excreted, whereas inorganic forms are taken up, and through production processes converted to organic forms . When these processes are accelerated as a factor of synergism between nutrients and pesticide residues, it could result in rapid increase of organic and inorganic nutrients contributing to eutrophication. Similarly, when the rate of pesticide residues being metabolized and excreted is enhanced owing to nutrient availability, then their persistence and potential toxicity is greatly reduced. Inhibition of metabolism and excretion of nutrients results in nutrient limitation in the environment and subsequent reduction in productivity . In contrast, inhibition of pesticide residue metabolism and excretion poses higher risks of toxicity to the organism, as well as to the food chain owing to bio concentration and bioaccumulation [62,73]. Oxygen dependent aerobic respiration produces 18 times more energy compared with anaerobic respiration . Poisoning and death caused by high concentrations of pesticides in aquatic ecosystem, could enhance the respiratory oxygen demand, promoting anaerobic environments. As a result, aquatic ecosystems would be less productive. Massive death of organisms due to extreme eutrophication and pesticide poisoning may result in transfer of accumulated pesticides into the sediments, reducing the exposure risk to pelagic organisms . Standing biomass of macrophytes might also lock accumulated pesticide residues over a long period, especially in nutrient poor systems, providing for seasonal time-bombs following subsequent degradation . The likelihood of combined effects is elevated since there is increased global use of both nutrients and pesticide products to enhance agricultural production for food security. Combined nutrients and pesticide residues in aquatic systems can be considered a cocktail, and their potential effects determined as effects of mixtures. Various assumptions have been put forth to explain the effects of mixtures including concentration addition, independent action and interaction. Concentration/dose addition (CA) approach assumes similar mode of action of the chemicals in the mixture. The effect of the mixture therefore comprises the additive effect of all the chemical components. The main disadvantage of this approach is that there is a chance of over estimating the actual potential effect. When the modes of action of the individual chemicals in the mixture are known, the independent action (IA) approach is considered to determine the mixture effect. The probability of effect from each mode of action or individual chemical is determined and then combined. In aquatic ecosystems, individual chemicals at a concentration below No Observable Effect Concentration (NOEC), and hence with limited response effect, will not contribute to the mixture effect. This approach might lead to underestimation of the actual effect, since even below NOEC of individual chemicals in the mixture, there is a probability of a mixture effect , often in the range of 5% to 20% . Chemicals in the mixture may affect the effects of the counterpart favouring the interaction approach with two pathways; synergism and antagonism . Synergism interaction of a mixture assumes that individual chemicals in the mixture amplify the effect potential of each other, or provide conditions for the counterpart to be more efficient, thereby generally intensifying the effect of the mixture. Synergism makes the mixture more toxic than the toxicity of individual chemicals in the mixture . Antagonism interaction on the other hand, results in a generally less toxic mixture compared with the toxicity of individual chemicals in the mixture especially when individual chemicals counteract the effect of each other . Interactions of mixtures are more probable in medium to high concentration exposures, and become complex in lower concentrations . Nutrients and pesticides have different modes of action, thus the concentration addition model would not fit a nutrientspesticides mixture. Moreover, nutrients may not be directly toxic to aquatic organisms, except in specific environmental conditions; for example ammonia in low pH conditions mainly unionised ammonia . At the same time, the effects of nutrients in enhancing aquatic productivity, and effects of pesticides in aquatic biota poisoning, suggest that using independent action theory would underestimate the cumulative effects of a nutrients-pesticides mixture. Generally, the interaction approach would be relevant in combined nutrient-pesticide effects studies. Limited studies have attempted to test the potential of interaction between nutrients and pesticides in a nutrients-pesticides mixture . Some of the studies on combined contamination have related the individual effects of nutrients and pesticides, and hypothesizing on potential results of the interaction in the aquatic ecosystems [24,52,58,81]. Other studies used the water quality guideline threshold values for the individual contaminants to set-up microcosm experiments to test the response on aquatic biota in setting up environmental guidelines [64,82] rather than the actual exposure concentrations. Several studies [70,71,83,84] carried out experiments to investigate the effects of combined contamination from nutrients and pesticides on macrophytes, periphyton and algal communities. In these studies however, the potential trophic interactions (bottom-up or top-down control) were not considered. Havens [58,73,78,85] explored the potential combined effects of nutrients and pesticides on aquatic food webs using models while focusing on low persisting pesticide groups such as chlorpyrifos and Carbaryl, with only few studies considering the persistent pesticides such as lindane [86,87] or DDT . The effects of combined nutrients and low persisting pesticides have been tested against zooplankton assemblage [88,89] in macrophyte dominated microcosms and diches close to single crop cultivation fields. Most of these studies have had little reference to the exposure status of combined nutrients and pesticide in the tropics, which faces increased and poorly regulated application of fertilizers and pesticides. Occurrence of nutrients and pesticides related pollutants negatively impacts aquatic ecosystems, and threatens aquatic ecosystem services, exerting pressure on managers and policy makers to change their management measures. With the evolving challenges in mixed pollutants, management of water pollutants require evidence based guidance for detection and identification, prioritization of actions, for the reduction of chemicals in the water cycle. Early detection of contaminants is an important factor in managing pollutants in the aquatic ecosystem. The detection approaches are commonly based on set indicators of monitoring, using water quality guidelines (WQGs). The guidelines are mainly tailored based on ambient contamination status and van Dam  recommends setting up of site specific WQGs. These WQGs set the stage for policies in handling natural water quality and consequently the contamination that would result from point and diffuse pollution sources, such as fertilizer and pesticide residues inputs. Approaches for detection of nutrients and pesticides in aquatic ecosystems have been well developed, although the data on the detected quantities is scanty especially in the Sub-Saharan Africa. Although various studies in Africa  have determined the loads of nutrients and pesticides, these studies mainly focused on detecting the nutrients and pesticides as separate elements. This has contributed to the management of the independent effects of nutrients and pesticides. Therefore, to manage the effects of combined nutrients and pesticides, there is increased need to adapt management strategies that are based on detection of both nutrients and pesticides in aquatic ecosystems. Adaptive management promotes a continuous learning-based framework for making decisions on resource conservation . However, the nexus of agricultural production and food demand, within the changing climate, makes the management of combined nutrients and pesticides contamination complex . At catchment level, the identification of drivers and pressures faced by the natural water resources is the first step, considering these resources are under threat of pollution from various sectors including industry, households, and agricultural production. To handle the potential pressure from widespread contamination of natural water resources, management measures need to incorporate a strategy to identify vulnerability to such pressures. The water quality standards in Sub-Saharan Africa mainly deal with the effluent discharges rather than aquatic ecosystems as a whole. The water quality legislation is not holistic and inadequate attention is paid to larger spatial scales as a factor of poor data interpretation on assessment of water quality and inadequate systematic monitoring. In most of the countries in Sub-Saharan Africa such as Tanzania and Uganda, main policy documents on water management are in place, however detailed instructions to prevent ambiguity based on those policy documents are missing. As such, the main challenge is the effectiveness of the water governance rather than the lack of governance arrangements. In totality, the broad failures in regulations place natural water resources (especially rivers and lakes) at a risk of contamination pressure following fertilizer and pesticides use . The outcome of this is eutrophication  or possible ecosystems, biota and human population poisoning , for instance in Lake Naivasha Kenya. This calls for the SSA nations not only to focus on holistic water resources policy, but also on the mechanisms to enforce the policies in a more people-involved, catchment based governance arrangements to cushion the intended agricultural expansion and intensification. As the demands on agriculture grows, and therefore the use and application of fertilizers and pesticide products, the increases in demand and supply of the fertilizers and pesticides , combined with the increased exposure of water resources to contamination as a factor of climate variability, degradation of catchments and land use changes  are putting pressure on water resources. As highlighted in this paper, deterioration of water resources is eminent. A business as usual idea will negatively impact on the water resources. As it is, water policies and legislations are not well equipped for the impending increases in use and application of fertilizers and pesticide products. The policies are based on ambient status of natural water quality and not equipped for potential increases. Furthermore, some of the policies in water resources protection have not factored potential for agricultural intensification and accompanying activities. To include the potential of future dynamics, it is important to recognise water as a finite resource with high consumption and use demands. With projected increase on water demand, and based on the demand placed on agricultural efforts, new management measures need to be explored and tested. Prioritization of management measures require detailed identification of specific indicators of management. (1) Identifying pressures to natural water resources and contributing drivers; (2) Employing the river basin approach; (3) Setting clear – ecological or chemical – status goals within timelines; (4) Inclusiveness and public involvement; (5) Building from already available systems; (6) Integration with other policies; (7) Considering potential future challenges e.g. climate change and variability; (8) Considering non-point pollution sources; (9) Factoring in water politics dynamics; and (10) Considering multijurisdiction processes. 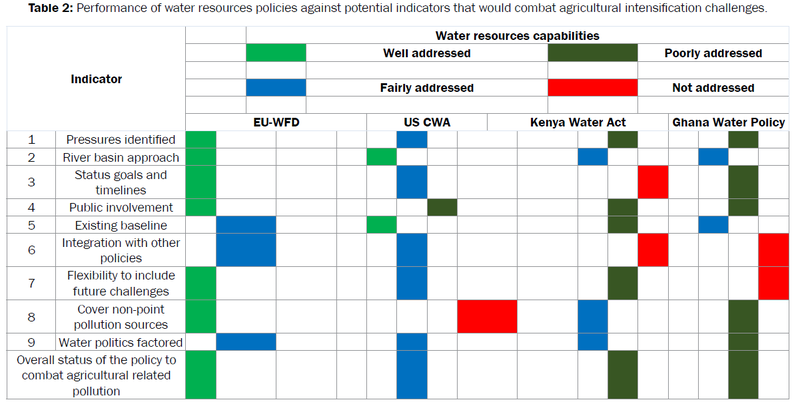 In the effort to compare the performance of water resources policies (Table 2) against the priorities, specific areas of improvement have been identified that would be useful in prioritization . Food production is needed to support the dietary and nutritional need of the growing global population. This has put pressure on the agricultural systems, to enhance the capacity of production. Although some agricultural systems have adopted sustainable application, with the increase in agricultural production, the increase in use of fertilizers and pesticides is inevitable. Since fertilizer and pesticide residues are transferred into aquatic ecosystems, their increase in use will enhance their level of contamination in ecosystems by nutrients and pesticides active substances. The negative effects of nutrients in aquatic ecosystems will therefore continue to manifest, while the toxicity of pesticide active substances continue to increase in aquatic ecosystems. This adds in the international dilemma between enhancing food production and protecting the environment. The multiple pressure from combined nutrients and pesticides has received limited attention, especially in the tropics. However evidence exists on the potential effects of combined nutrients and pesticides, which require inclusion in setting water quality guidelines. The interaction between the individual effects of nutrients and pesticides in aquatic ecosystems, suggest that the potential effect of agricultural intensification to water basins is widely underestimated. This needs continuous set up of experiments to determine the breath of the effect of combined nutrients within different agricultural catchments. Managing the combined effects of nutrients and pesticides still faces approach challenges, especially since the current measures are based on independent determination contamination. Better management systems would inevitably require that efforts for detecting and identification of nutrients and pesticides are carried out in combination. The availing of combined contamination data, will therefore contribute to the prioritization of measures, depending on catchment needs. WHO. Diet, nutrition and the prevention of chronic diseases: Report of a joint WHO/FAO expert consultation. WHO and FAO: Geneva, Switzerland. 2002. FAO. Current world fertilizer trends and outlook to 2020. Viale delle Terme di Caracalla, 00153 Rome, Italy: Food and agriculture organization of the United Nations. 2017. Population Total. In: GROUP, T. W. B. (ed.) Datasets Listed in The World Bank Data Catalogue. ROSER M, ORTIZ-OSPINA E. World Population Growth. 2018. Rosegrant MW, Cline SA. Global food security: Challenges and policies. Science. 2003;302:1917-1919. Henningsson S, Hyde K, Smith A, et al. The value of resource efficiency in the food industry: a waste minimisation project in East Anglia, UK. J Cleaner Production. 2004;12:505-512. Godfray HCJ, Beddington JR, Crute IR, et al. Food security: The challenge of feeding 9 billion people. Science. 2010;327:812-818. De Graaff J, Kessler A, Nibbering JW. Agriculture and food security in selected countries in Sub-Saharan Africa: Diversity in trends and opportunities. Food Security. 2011;3:195-213. Chen M, Graedel TE. A half-century of global phosphorus flows, stocks, production, consumption, recycling, and environmental impacts. Global Environmental Change. 2016;36:139-152. Clark M, Tilman D. Comparative analysis of environmental impacts of agricultural production systems, agricultural input efficiency, and food choice. Environ Res Lett. 2017;12:064016. Tilman D, Fargione J, Wolff B. Forecasting Agriculturally Driven Global Environmental Change. Science. 2001;292. Fertilizer consumption (% of fertilizer production). World Bank Group. 2017a. Zhang WJ, Jiang FB, Ou JF. Global pesticide consumption and pollution: With China as a focus. Int Acadm Eco & Enviro Science. AGRIS. 2011;125-144. Fishel FM. Pesticide use trends in the US: Global comparison Department, Pesticide Information Office, UF/IFAS Extension. Gainesville, FL: University of Florida. 2016. Tommy D, Birgitte H, Berit H, et al. Policies for agricultural nitrogen management-Trends, challenges and prospects for improved efficiency in Denmark. Environ Res Lett. 2014;9:115002. Christian F, Hong Y, Thomas G, et al. Effects of ecological and conventional agricultural intensification practices on maize yields in sub-Saharan Africa under potential climate change. Environ Res Lett. 2014;9:044004. Adrian L, Gilles B, Josette G, et al. Impacts of European livestock production: Nitrogen, sulphur, phosphorus and greenhouse gas emissions, land-use, water eutrophication and biodiversity. Environ Res Lett. 2015;10:115004. Marta T, Sergi S, Vicenç A. Identifying regions vulnerable to habitat degradation under future irrigation scenarios. Environ Res Lett. 2016;11:114025. Papendick RI, Elliott LF, Dahlgren RB. Environmental consequences of modern production agriculture: How can alternative agriculture address these issues and concerns? Am J Alternat Agric 1986;1:3-10. Aragón-Noriega LE, Calderon-Aguilera EA. Does damming of the Colorado River affect the nursery area of blue shrimp Litopenaeus stylirostris (Decapoda: Penaeidae) in the Upper Gulf of California? Revista de Biologia Tropical. 2000;48:867-871. Unep Globio. Global methodology for mapping human impacts on the biosphere. UNEP/DEWA. 2001. Ongley ED. Control of water pollution from agriculture. FAO irrigation and drainage. Rome: Food and Agriculture Organization of the United Nations. 1996. Weston DP, You J, Lydy MJ. Distribution and Toxicity of Sediment-Associated Pesticides in Agriculture-Dominated Water Bodies of California's Central Valley. Environ Science Technol. 2004;38:2752-2759. O´Toole C, Irvine K. Response of Aquatic Biota to Combined Pressure from Nutrients and Priority Substances. Indicators and Methods for the Ecological status assessment under the Water Framework Directive: Linkages between chemical and biological quality of surface waters. Luxembourg: Institute for Environment and Sustainability. 2006. Kortenkamp A, Backhaus T, Faust M. State of the art report on mixture toxicity. London: The School of Pharmacy University of London for European Commission. 2009. Ranganathan J. The Global Food Challenge Explained in 18 Graphics. In: Creating a Sustainable Food Future: Interim Findings: A menu of solutions to sustainably feed more than 9 billion people by 2050. Washington, DC: WRI. 2013. World agriculture: Towards 2015/2030. In: BRUINSMA, J. (ed.) An FAO Perspective. Rome: FAO. 2003. Alexandratos N, Bruinsma J. World agriculture towards 2030/2050: The 2012 revision. ESA Working Paper. Rome: FAO Agricultural Development Economics Division. 2012. Wheeler T, Von Braun J. Climate change impacts on global food security. Science. 2013;341: 508-513. FAO, IFAD, UNICEF, WFP, WHO. The State of Food Security and Nutrition in the World 2017: Building resilience for peace and food security. Rome: FAO. 2017. Gregory PJ, Ingram JSI, Brklacich M. Climate change and food security. Philosophical Transactions of the Royal Society B: Biological Sciences. 2005;360:2139-2148. FAO. Climate change and food security: a framework document. Rome, Italy: Food and Agriculture Organisation of the United Nations. 2008a. Devereux S, Edwards J. Climate Change and Food Security. IDS Bulletin. 2004;35:22-30. Darwin R. Climate Change and Food Security. Agriculture Information Bulletin, 2001;765. Van Vuuren DP, Bouwman AF, Beusen AHW. Phosphorus demand for the 1970–2100 period: a scenario analysis of resource depletion. Glob Environ Change. 2010;20:428-439.
Cooper J, LombardI R, Boardman D, et al. The future distribution and production of global phosphate rock reserves. Reso Conser Recy. 2011;57:78-86. Heffer P, Prud’homme M. Fertilizer Outlook 2014-2018. Fertilizer Outlook. ue Marbeuf, Paris, France International Fertilizer Industry Association (IFA). 2014. FAO. Current world fertilizer trends. Viale delle Terme di Caracalla, 00153 Rome, Italy: Food and Agriculture Organization of the United Nations. 2008b. FAO. Current world fertilizer trends. Rome, Italy: United Nations Food and Agricultural Organization. 2011. Heffer P, Prud’homme M. Fertilizer. Ue Marbeuf, Paris, France International Fertilizer Industry Association (IFA). 2013. Van Kauwenbergh SJ. Fertilizer Raw Material Resources of Africa. Muscle Shoals, Alabama: International Center for Soil Fertility and Agricultural Development. 2006. Mabiso A, Pauw K, Benin S. Agricultural Growth and Poverty Reduction in Kenya: Technical Analysis for the Agricultural Sectoral Development Strategy (ASDS) - Medium Term Investment Plan (MTIP). Washington, DC: International Food Policy Research Institute. 2012.
Cooper J, Dobson H. The benefits of pesticides to mankind and the environment. Crop Protection. 2007;26:1337-1348. Aktar MW, Sengupta D, Chowdhury A. Impact of pesticides use in agriculture: Their benefits and hazards. Interdi Toxicol. 2009;2:1-12. SPOPC, S. O. T. S. C. Listing of POPs in the Stockholm Convention. Geneva, Switzerland: Stockholm Persistent Organic Pollutants Convention 2001 (SPOPC). 2012. Madadi O V, Wandiga SO, Jumba IO. The status of persistent organic pollutants in Lake Victoria catchment. In: Odada EO, Olago DO, Ochola W, et al. eds. World Lakes Conference, 2005 Nairobi, Kenya. Ministry of Water and Irrigation; International Lake Environment Committee, 2005;107-112. FAOSTAT. Agri-environmental Indicators: Pesticide use in active ingredient on arable land and permanent crops (tonnes per 1000 Ha) by country average 1992-2010. Rome: United Nations Food and Agricultural Organization Statistics. 2014. IRAC. Insecticide Resistance: Causes and Action. Insecticide Resistance Action Committee. 2013. Quinn LP, De Vos BJ, Fernandes-Whaley M, et al. Pesticide Use in South Africa:One of the Largest Importers of Pesticides in Africa. In: STOYTCHEVA, M. (ed.) Pesticides in the Modern World-Pesticides Use and Management. Rijeka, Croatia: InTech. 2011. Ranson, H, N’guessan R, Lines J, et al. Pyrethroid resistance in African anopheline mosquitoes: what are the implications for malaria control? Trends in Parasitol. 2011;27:91-98. Onyango J, Kreuzinger N, Kitaka N. Pesticides Residues Contamination in Lake Naivasha Catchment, Kenya. AV Akademikerverlag. 2015. Skei J, Larsson P, Rosenberg R, et al. Eutrophication and Contaminants in Aquatic Ecosystems. J Human Environ. 2000;29;184-194. Howarth RW, Marino R. Nitrogen as the limiting nutrient for eutrophication in coastal marine ecosystems: Evolving views over three decades. Limnology and Oceanography. 2006;51:364-376. Camargo JA, Alonso A. Ecological and toxicological effects of inorganic nitrogen pollution in aquatic ecosystems: A global assessment. Environ Int. 2006;32:831-849. Durand P, Breuer L, Johnes PJ, et al. Nitrogen processes in aquatic ecosystems. In: Bleeker A, Grizzetti B, Howard, C, et al. (eds.) The European Nitrogen Assessment: Sources, Effects and Policy Perspectives. Cambridge: Cambridge University Press. 2011. Rabalais NN. Nitrogen in Aquatic Ecosystems. AMBIO: J Human Environ. 2002;31:102-112. Nierenberg D. Toxic Fertility. Washington DC: World Watch. 2001. Koelmans AA, Van Der Heijde A, Knijff LM, et al. Integrated modelling of eutrophication and organic contaminant fate & effects in aquatic ecosystems. A review. Water Res. 2001;35:3517-3536. Saitoh K, Kuroda T, Kumano S. Effects of organic fertilization and pesticide application on growth and yield of field-grown rice for 10 years. Jap J Crop Sci. 2001;70:530-540. Kamrin M A. Pesticide Profiles: toxicity, environmental impact, and fate, CRC Press LLC. 1997. Rockets R. Down On The Farm Yields, Nutrients And Soil Quality. Scienceagogo.com. 2007. Czub G, Mclachlan MS. Bioaccumulation Potential of Persistent Organic Chemicals in Humans. Environ Scie Technol. 2004a;38:2406-2412. Kerbs JR, Wilson JD, Bradbury RB et al. The second silent spring. Commentary in Nature. 1999;400:611-612. Ritter L, Solomon K, Sibley P, et al. Sources, pathways, and relative risks of contaminants in surface water and groundwater: A perspective prepared for the Walkerton inquiry. J Toxicol Environ Health. 2002;65:1-142. Miller GT. Sustaining the Earth, Pacific Grove, Thompson Learning, Inc. 2004. Kellogg RL, Nehring R, Grube A et al. Environmental Indicators of Pesticide Leaching and Runoff from Farm Fields. Agricultural Productivity: Data, Methods, and Measures. Washington DC. : USDA. 2000. Luo Y, Spurlock F, Deng X, et al. Use-Exposure Relationships of Pesticides for Aquatic Risk Assessment. PLOS ONE. 2011;6:e18234. Relyea RA. A cocktail of contaminants: how mixtures of pesticides at low concentrations affect aquatic communities. Oecologia. 2009;363-376. Roessink I, Koelmans AA, Brock TCM. Interactions between nutrients and organic micro-pollutants in shallow freshwater model ecosystems. Scie Total Environ. 2008;406:436-442. Wendt-Rasch L, Van Den Brink PJ, Crum SJH et al. The effects of a pesticide mixture on aquatic ecosystems differing in trophic status: responses of the macrophyte Myriophyllum spicatum and the periphytic algal community. Ecotoxicol Environl Safety. 2004;57:383-398. Baker LF, Mudge JF, Thompson DG, et al. The combined influence of two agricultural contaminants on natural communities of phytoplankton and zooplankton. Ecotoxicology. 2016;25:1021-1032. Pinto-Coelho RM, Bezerra-Neto JF, Morais-Jr CA. 2005. Effects of eutrophication on size and biomass of crustacean zooplankton in a tropical reservoir. Brazilian Journal of Biology, 65, 325-338. Traas TP, Janse JH, Van Den Brink PJ, BROCK, et al. A freshwater food web model for the combined effects of nutrients and insecticide stress and subsequent recovery. Environ Toxicol Chem. 2004;23:521-529. Czub G, Mclachlan MS. A food chain model to predict the levels of lipophilic organic contaminants in humans. Environ Toxicol Chem. 2004b;23:2356-2366. Roessink I, Arts GHP, Belgers JDM, et al. Effects of lambda-cyhalothrln in two ditch microcosm systems of different trophic status. Environ Toxicol Chem. 2005;24:1684-1696. Hanlon SM. Varying effects of agricultural pesticides on host-pathogen interactions and aquatic ecosystems in an amphibian system, The University of Memphis. 2013. Peters K, Bundschuh M, Schäfer RB. Review on the effects of toxicants on freshwater ecosystem functions. Environ Pollut. 2013;180:324-329. Breitburg DL, Sanders JG, Gilmour CC, et al. Variability in responses to nutrients and trace elements, and transmission of stressor effects through an estuarine food web. Limnol Oceano. 1999;44:837-863. Brock TCM, Roijackers RMM, Rollon R, et al. Effects of nutrient loading and insecticide application on the ecology of Elodea-dominated freshwater microcosms. II. Responses of macrophytes, periphyton and macroinvertebrate grazers. Arch Hydrobiol. 1995;134:53-74. Opinion on the toxicity and assessment of chemical mixtures. Scientific committee on healthand environmental risks; Scientific committee on consumer safety; scientific committee on emerging and newly identified health risks on European Union. 2012. Skei J, Hylland K, Schaanning MT, et al. Interactions between eutrophication and contaminants. I. Principles, experimental design and synthesis. Mar Pollut Bull. 1996;33:64-70. Van Dam RA, Humphrey CL, Harford AJ, et al. Site-specific water quality guidelines: 1. Derivation approaches based on physicochemical, ecotoxicological and ecological data. Environ Sci Pollut Res Int. 2014;21:118-30. Brock TCM, Van Den Bogaert M, Bos AR, et al. Fate and effects of the insecticide Dursban® 4E in indoor Elodea-dominated and macrophyte-free freshwater model ecosystems: II. Secondary effects on community structure. Arch Environ Contam Toxicol. 1992;23:391-409. Cuppen JGM, Gylstra R, Beusekom SV, et al. Effects of nutrient loading and insecticide application on the ecology of Elodea-dominated freshwater microcosms. III. Oxygen metabolism, decomposition and responses of macroinvertebrate detritivores. Archiv für Hydrobiologie. 1995;134:157-177. Havens KE. An experimental comparison of the effects of two chemical stressors on a freshwater zooplankton assemblage. Environmental Pollution. 1994;84:245-251. Barry MJ, Logan DC. The use of temporary pond microcosms for aquatic toxicity testing: direct and indirect effects of endosulfan on community structure. Aqua Toxicol. 1998;41:101-124. Van Den Brink PJ, Hartgers EM, Gylstra R, et al. Effects of a Mixture of Two Insecticides in Freshwater Microcosms: II. Responses of Plankton and Ecological Risk Assessment. Ecotoxicol. 2002;11:181-197. Van Den Brink PJ, Hattink J, Bransen F. Impact of the fungicide carbendazim in freshwater microcosms. II. Zooplankton, primary producers and final conclusions. Aquat Toxicol. 2000;48:251-264. Ieromina O, Peijnenburg WJGM, De Snoo GR, et al. Population responses of Daphnia magna, Chydorus sphaericus and Asellus aquaticus in pesticide contaminated ditches around bulb fields. Environ pollut. 2014;192:196-203. Williams BK. Passive and active adaptive management: Approaches and an example. J Environ Manag. 2011;92:1371-1378. Berkes F, Colding J, Folke C. Rediscovery of traditional ecological knowledge as adaptive management. Ecol Appl. 2000;10:1251-1262. UN-WATER. Towards a Worldwide Assessment of Freshwater Quality: A UN-Water Analytical Brief. 2016.